The Travelling Lindfields: A complete guide to visiting the Pyramids of Giza and my tips to avoid the scams. 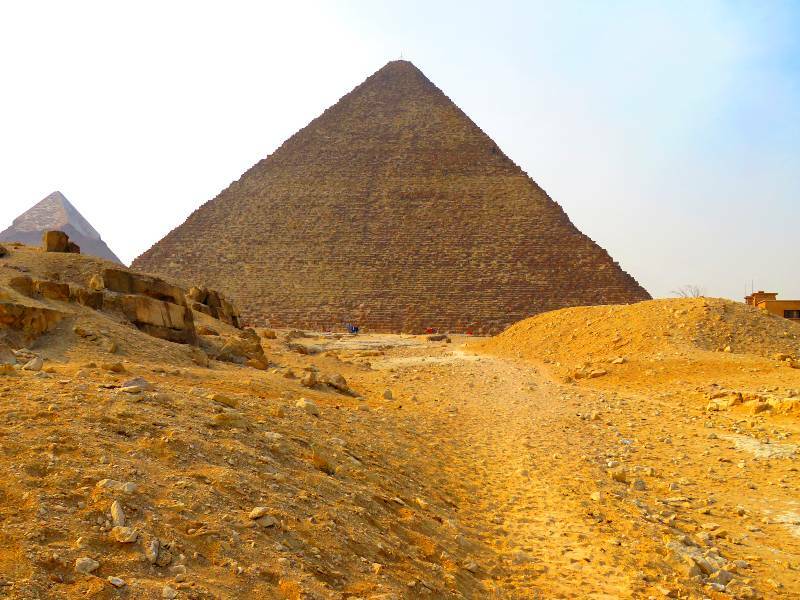 A complete guide to visiting the Pyramids of Giza and my tips to avoid the scams. There is nothing in the world quite like the Pyramids of Giza. Built more than 4,500 years ago, they are the only one of the seven wonders of the ancient world in existence today. To say the feeling of standing in front of them and looking up is awesome doesn't come anywhere near to describing it. Sadly however, the one thing most difficult to do at the pyramids is to stand back and soak in the atmosphere. and small-time con artist in Egypt. Whether you are interested in what they are selling or not these people will dog your every step showing levels of persistence (and annoyance) going beyond anything you can imagine. David, our son Andrew, and I have visited the pyramids on three separate occasions and been conned (in small ways) on two of these. This despite the fact that both Andrew and David have great personal scam-detecting radar. I, on the other hand, will fall for every scam out there. They say fore-warned is fore-armed so I have drawn up this guide to help you through the pyramid sight-seeing maze in the hope you might do better than we did. Good luck! The Pyramids of Giza are not the only pyramids in the world. There are pyramids in Sudan, Mexico, Italy and many others scattered throughout Egypt, but the pyramids which come to mind when you hear the word 'pyramid' are the fabulous ancient man-made mountains of stone at Giza, just south of Cairo. There are six pyramids at Giza - the Great Pyramid of Khufu (Cheops), the Pyramid of Khafre and the Pyramid of Menkaure, along with three much smaller structures known as the Queens' Pyramids. There is also a scattering of underground tombs and the Great Sphinx - a mythical creature with the body of a lion and the head of a man. 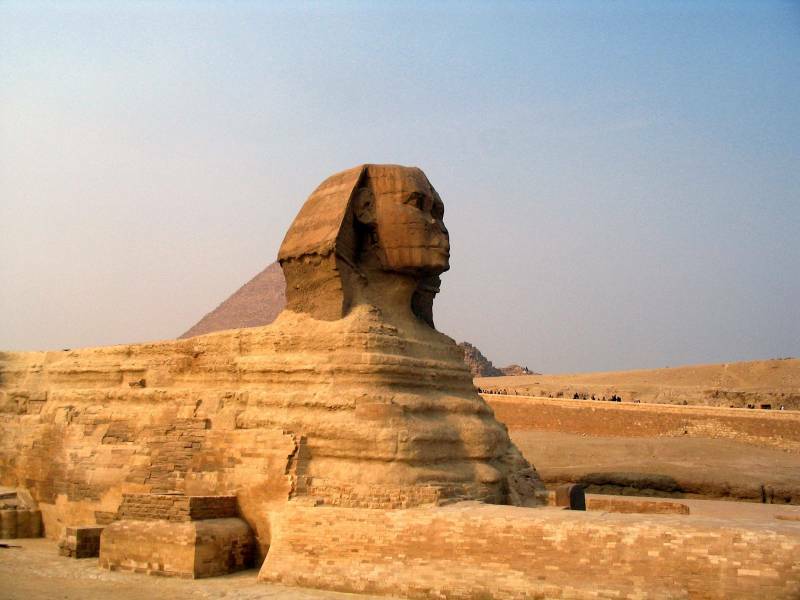 Although there are many sphinxes in Egypt none are as impressive as the Great Sphinx of Giza. Contrary to popular myth the Sphinx's missing nose was not knocked off by Napoleon's canons - there are historical accounts of the noseless Sphinx long before Napoleon came anywhere near it. The pyramids were built as tombs for the Egyptian pharaohs Khufu (who built the Great Pyramid), Khafre (Khufu's son) and Menkaure. Ancient Egyptians believed they would need their earthly bodies in the afterlife. The pyramids were built to protect their mummies and house treasure and other items they wished to take with them. As monuments to the power and wealth of the pharaohs the pyramids are unsurpassed. 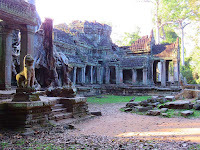 As tombs to protect their treasure and earthly remains, the structures were spectacularly unsuccessful. All three pyramids were plundered long before modern times and none of the mummies have ever been found, although one theory suggests that Khafre's body may still lie in a hidden chamber within the Great Pyramid. The pyramids are about 15 kms (9 miles) south west of central Cairo, more or less as the crow flies. Traffic in Cairo is diabolical so it can take anything between 30 and 90 minutes to get there by car. Although strictly speaking Giza is a city in itself, don't expect to go through any countryside. Cairo and Giza are inextricably mixed in a teeming urban jungle of 20 million people. Hire Car - David, Andrew and I took a private hire car with driver. We stayed in Central Cairo and arranged it through our hotel concierge. 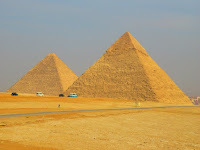 For 1350 Egyptian pounds (105AUD/75USD) we had the car for six hours, enough time to explore the pyramids at our leisure. It wasn't cheap but it had the advantage that we had the car to drive us around the complex once we got there and we knew we would have no issues getting back to Cairo. Taxi - Good luck with this one! Cairo taxis don't have meters which means you have to haggle with the driver to set a fare. Make sure you do this before you set off to avoid any surprises at the end. Also ensure you specify Egyptian Pounds. We came across a few souvenir sellers who touted prices which magically changed from Egyptian pounds to US dollars late in the bargaining process. I am not saying this happens with Cairo taxis but why take the chance. Uber - Ubers work brilliantly in Cairo. Taxi drivers know you are a tourist and inflate their prices accordingly. Because the uber fare is set by a computer algorithm you pay the same as the locals and there is no issue with trying to make the driver understand where you want to go. You enter the destination on your phone in English (or whatever) and he reads it on his phone in Arabic. We caught more than a dozen ubers around Cairo in the time we were there and didn't have a single bad experience. Public Transport - Sorry, you are on your own here. The thought of figuring out Cairo's public transport system is a step too far for me. You have two options - stay in Central Cairo or stay out at Giza. Which one you choose depends on how much of Cairo you want to see. 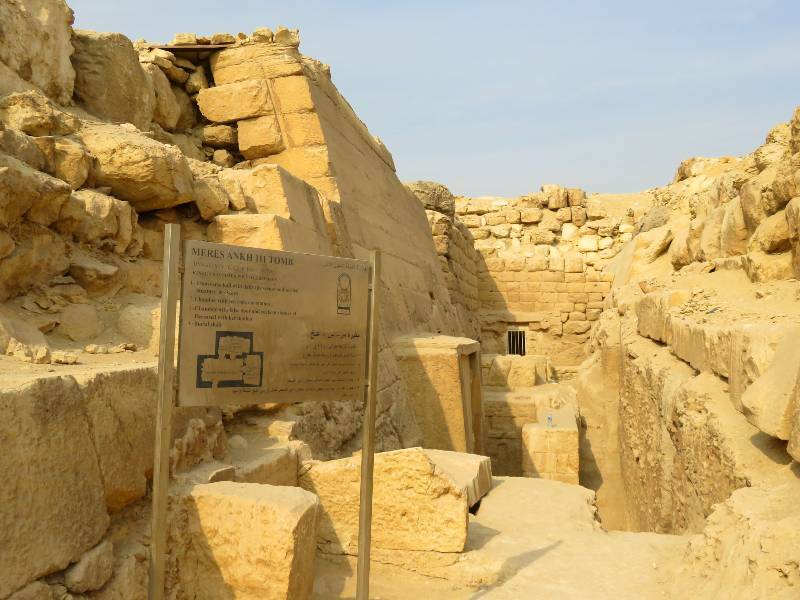 Giza is better located for the Pyramids of Giza as well as the Bent Pyramid, the Step Pyramid and Saqqara Necropolis where you will find the newly opened Tomb of Mehu. Cairo is better for the Eyptian Museum and a host of other attractions such as the Citadel of Salah Al Din, Coptic Cairo, Islamic Cairo and Khan Al Khalili. 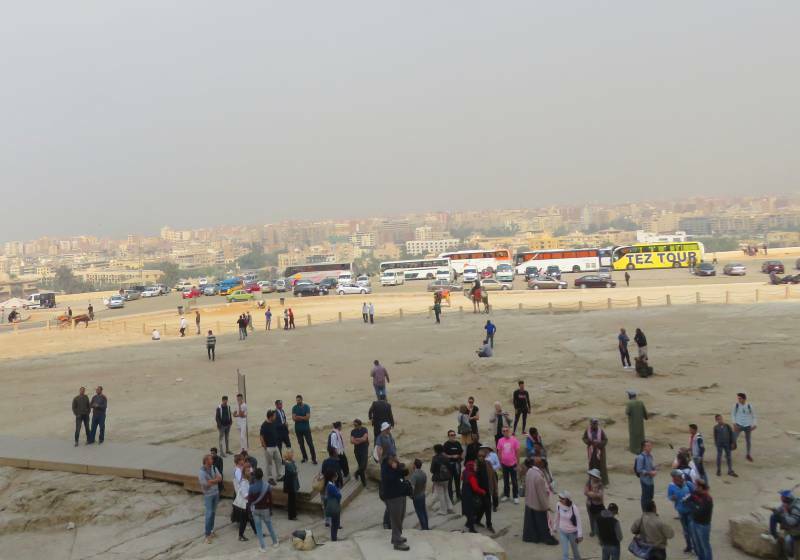 Note: The new Egyptian Museum being built at Giza was not open when we visited in November/December 2018. Years behind schedule the opening seems to be a while away yet. We stayed at the Conrad in Central Cairo. While the views over the Nile are lovely and the service and staff impeccable the rooms themselves are tired and in need of renovation. If you want to wake up each morning, pull the curtains and see the Pyramids up close you could try Mena House. However two of the other guests on our Nile Cruise stayed at Mena House and told me the rooms are badly in need of refurbishment. The main entrance and ticket office is in Al Haram Rd. Your taxi, uber or hire car will drop you right outside. If your hire car is going to drive you around the complex you still need to walk over to the window, buy your tickets and go through the security screening point before meeting your car and driver in the car park immediately to the left of the entrance. Bring cash - the ticket office does not take credit cards. You need to buy all your tickets before you enter except the ticket for the boat museum, You can go back out to buy extra tickets but it is a hassle. You will also need a car ticket for your hire car if you have one. If your driver tells you you should only buy a General Entrance ticket, ignore him. He wants to hand you over to one of the local guides once you are inside who will then push you to also engage a horse/camel driver. Everyone no doubt gets a commission for this which is fair enough, but you end up being pushed through at their pace, not yours. I suspect they don't like you going inside the pyramids, especially the Great Pyramid, because it takes time. 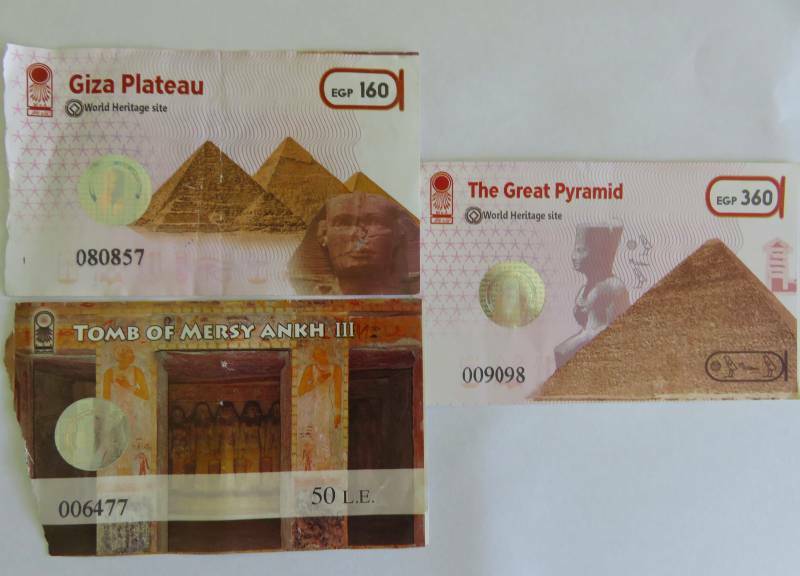 Your General Entrance, inside the Great Pyramid and Tomb of Meresankh III tickets should look like these. Note 1: These are our used tickets. Yours will not have been torn off. Note 2: Meresankh seems to have many different spellings. Do you need a guide and how to avoid getting stuck with one? The short answer is no! The magical thing about the pyramids is just standing there and looking up at them. You don't need a guide for that. In fact we found the constant stream of talking from the guide we got stuck with distracted us from the very thing we came to see. We ditched him as soon as we could. You will be accosted by 'official guides' who tell you they are paid by the government - until the end of the 'tour' they more or less force you to take - when suddenly they aren't paid by the government any more and they want to be paid by you. As rude as it seems from a western point of view you must practise the art of ignoring people. If you do want a guide you will find plenty hanging around near the Great Pyramid waiting for work. Are the pyramids crowded and when is it best to go? You can ignore all that advice about arriving early or late to avoid the crowds - there aren't any. The thing which struck us most about our recent visit to Egypt was the almost complete lack of crowds compared with our visit twelve years ago. Egyptian tourism has never recovered from the Arab Spring and more recent terrorist incidents. We were in Egypt in November/December 2018. A few local operators told us that tourist numbers were picking up and would be greater after Christmas but they didn't sound convincing. I took this with my back to the Great Pyramid. This was about as crowded as it got all day. Do you need to hire a horse or camel and how to avoid getting stuck with one? Your 'guide' - the one you didn't want but who attached himself to you anyway - will tell you it is too far to walk around the pyramids. He will say this just as his cousin/brother/nephew arrives with a horse/camel for you to hire. Ignore him! Unless, of course, you want that horse or camel. There is no reason you shouldn't but, just to be clear, you can see the pyramids perfectly well on foot. The only exception to this is the panoramic viewpoint where nearly all those shots of the pyramids lined up are taken from. If you don't have a hire car, taxi, uber, horse or camel to help you get there it is a long walk. 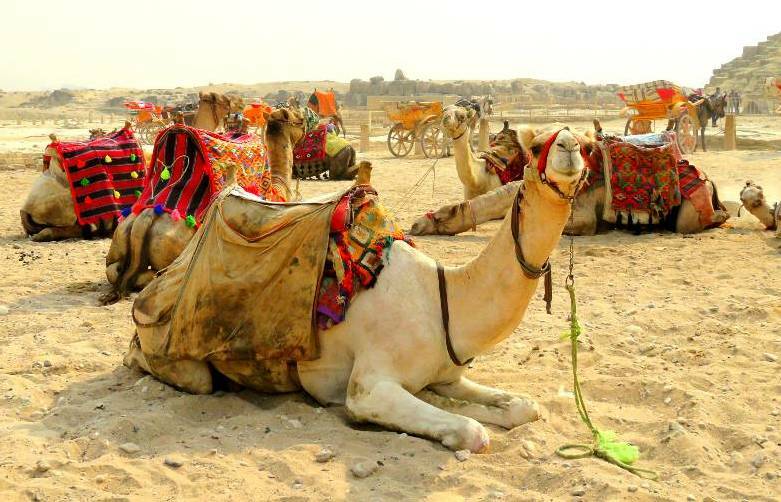 It isn't just the humans who will try to charm you into taking a camel ride! Should you go inside the pyramids and if so which one? Yes! At 360 Egyptian Pounds the ticket to go inside the Great Pyramid of Khufu (Cheops) is vastly over-priced for what you get but hey you have flown all the way from Australia/America/Europe, this isn't the time to worry about value for money. While there is more or less nothing to see, the experience of being inside one of the ancient wonders of the world is absolutely worth it. The Great Pyramid is closed for cleaning between 12 pm and 1 pm. If you want it more or less to yourself arrive about 11.45 am ignoring all the touts who will tell you it is already closed - it isn't. We got there at 11.50 am and there was only one other person there. The entrance is in the centre of the front face of the Great Pyramid a few metres above ground level - just look for people climbing up. Once inside the Great Pyramid you will climb a narrow steep passageway which opens out into the (now empty) King's Chamber. It is hot, humid and claustrophobic. Don't arrive just after 1 pm when it re-opens unless you like crowded, hot, humid, claustrophobic spaces. At 100 Egyptian Pounds the ticket to go inside the Pyramids of Khafre and Menkaure is much less expensive but - it isn't the same. Unless your budget is ultra-tight, spend the extra and go inside the Great Pyramid. Khafre and Menkaure usually alternate the days on which they are open. Leave this until last. Except for the loop to the panorama spot, the pyramids road is a one-way system. Don't allow yourself to be rushed toward the Great Sphinx which is just before the exit. Yes - especially if you are not going on to Luxor where the Valley of the Kings is located. The tomb has recently been re-opened after being closed for 25 years. Although there are other tombs around, the Tomb of Meresankh III is one of the best preserved. Note: You need a separate ticket for the Tomb of Meresankh III which you must purchase when you buy your entrance ticket. To find the tomb head toward the Eastern Cemetery where you need to find a guard to unlock the tomb. Just wave your ticket around and you'll soon attract the attention of one who will guide you to the tomb, unlock it and show you inside. Be prepared to tip him for this service. In three separate visits to the pyramids we have never made it inside this museum. The boat was found buried near the Great Pyramid where it was left to give Khufu transportation to the next world. Plan to be at the pyramids for the whole day. They have been waiting for you for 4,500 years - don't rush them. Go back for a second visit. Get the lay of the land on your first visit and then go back a day or two later for a more leisurely chance to really soak up the history. No matter how well prepared you are you will still feel hassled and pushed through. 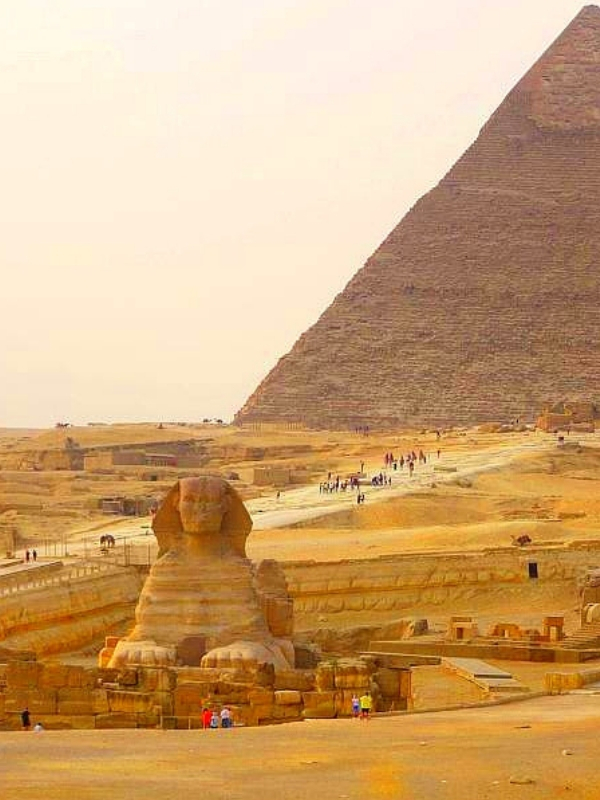 Be firm about spending as much time as you want looking in turn at each of the pyramids and the Great Sphinx. If your driver/guide is pushing you along it will be because he wants to take you to his cousin's perfume or papyrus shop on the way back to your hotel. Go inside at least one of the pyramids, preferably the Great Pyramid. There isn't much to see but the feeling of being inside such a magnificent structure with so much history is awesome. Take a hat, sunscreen and water. It is hot in the desert, even in winter. Practise ignoring people before you go. Do not respond to questions, jokes or conversation starters. 'Where are you from?' 'How are you my friend?' 'My brother/uncle/cousin/nephew (or other male relative) lives in Melbourne/Sydney.' These are all preludes to an attempt to part you from your money. When you leave have a late lunch/afternoon tea at the Pizza Hut opposite the exit where the Sphinx is - even if you don't like pizzas. The view from the rooftop terrace is perfect. The pyramids are open from 8 am to 4 pm daily. 11 things to do in Alexandria -one is a bit weird! Thank you for taking the time to read our blog. I hope you get to visit the Pyramids of Giza one day and when you do these tips are useful. If you would like to follow our travels, enter your email address in the 'Never miss a post: Follow by email' box in the right hand sidebar just below our profile picture. I promise there is an unsubscribe button if you get sick of us. Save this for later. Pin it to Pinterest. This is fantastic. So many great tips. I am honestly surprised to read that their are no crowds, and getting into the great pyramid with just one other person seems impossible. I love your description of the guide you didn't want and the camels appearing with his brother. This reminds me so much of Morocco. Haha - I am beginning to think that having been to Egypt twice I can probably skip Morocco. D isn't all that keen to go to yet another hassle-ridden destination. I am so good at ignoring touts at places LOL. Built that skill over 8 years, and released Western Guilt too. I keep walking. No noting or nodding unless someone blocks my walk; then I smile and move around. We owe nothing to anyone. Plus, people know when they are being rude or not since we are all human. Super write up! I have to practice your skills. I feel so rude not responding to people even though I know they just want to sell me something I don't want to buy. The worst are the little children who throw things at you and then want to be paid. What a fabulous guide and I so appreciate how you have included the realities of what one will face as far as hassles and scams. I think being prepared for that is as important as the details of where to go. One would really want to be in the right head space to attempt it. Might require some mental training! Mental training doesn't begin to describe it but if you accept the scams will happen that helps a lot with not getting annoyed about them. Oh, my -- you got to visit the Great Sphinx! I would love, love, love to visit the pyramids in Egypt. Thanks for taking me there in your photos! I hope you get there one day. The sphinx is every bit as fabulous as you think it is going to be - maybe a bit smaller perhaps. Thanks for sharing Lyn! We’re going to Egypt this Easter in April and this is going to be very useful! If you are headed to Egypt you should watch out for my future posts, I have lot more Egypt posts in the pipeline. This is an incredible post about the Pyramids of Giza. Thx so much for all the tips. This is a really helpful guide! I haven't been yet but it's sure on my list. I have heard from quite a few people that tourism to Egypt is still really low- sad for the country, but perhaps a good time to visit to avoid big crowds. The difference in the number of other tourists we saw around when we visited Egypt in 2006 and in 2018 was staggering. We went in December both times so it wasn't a time of year variation. I would say go now before tourism picks up again but there was a terrorist attack on a tour bus near the pyramids a week or so after we left and quite a few tourists were killed so you do have to weight up the safety aspect. I enjoyed revisiting the Pyramids of Giza with you. Sounds like some things have changed since my visit long ago, but not many. Good tips, all. Except for the crowds, only a few things had changed since we were in Egypt the first time - in 2006. Lynn, this is a great round up and overview. My nephew was there before Christmas and noted the lack of tourists, endless pushy vendors, etc. When in India, a guide's sage advice was: "Yes" is yes, "no" is yes. Avoid all eye contact. Don't stop. He - quite rightly -had no sympathy for anyone who disregarded his advice! Wise advice but very difficult to implement when you have been raised in a culture of responding politely to anyone who wishes to gain your attention. I am amazed how uncrowned the pyramids have become! I also visited them about 12 years ago and the crowds were overwhelming. The only way to get away from the crowds was to go to the dunes behind the pyramids (probably the viewpoint, you mention). Also great to read that uber works well in Cairo. It seems to be becoming the transport of choice for travelers. I just had fantastic experience in Brazil with it. I wonder how quickly tourism will rebound once the safety aspect improves. We were told by a few people that tourist numbers were on the rise again but it is hard to tell. This is really helpful information for this type of trip. I'm not headed to see the pyramids anytime soon, but if I was going to Egypt I'm thankful for your tips to avoid the scams. I would have thought you would need a tour. For anyone who feels like they might miss out by not taking a tour, I would suggest they take a tour first then go back on their own. I find you get a lot of information with tours (much of which you don't really care about) but tend to miss the 'just standing back in awe' factor. Also we travelled with our 26 year old son and a huge part of the fun throughout Egypt was discovering things on our own, getting lost, finding ourselves again, reading out our guide book to each other and generally having a great time without being herded along in a group. I've been to the pyramids and still learned a ton of things I didn't know from your guide! Will be putting your tips to use soon. Thank you! I am sure you will have a great time. Pinned. 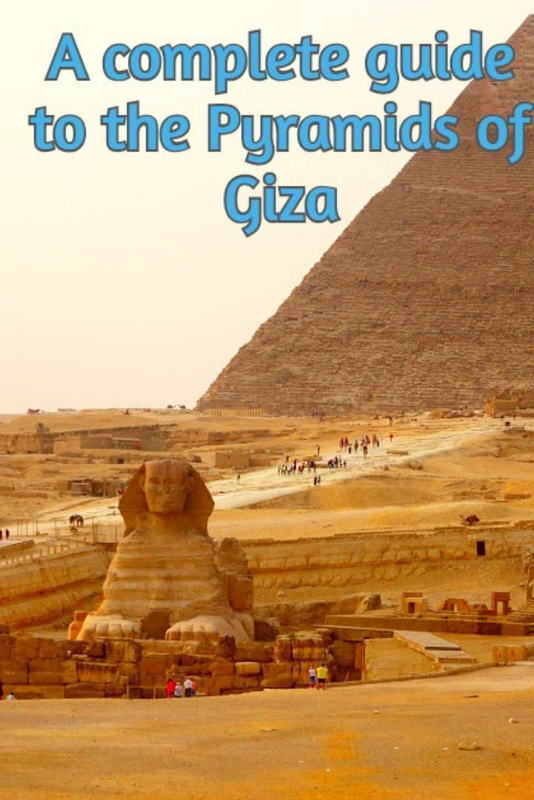 A wonderful and complete guide to the pyramids, this will help anyone visiting Egypt. Our experience was with a guide - but he was a friend of a friend we used for several days. 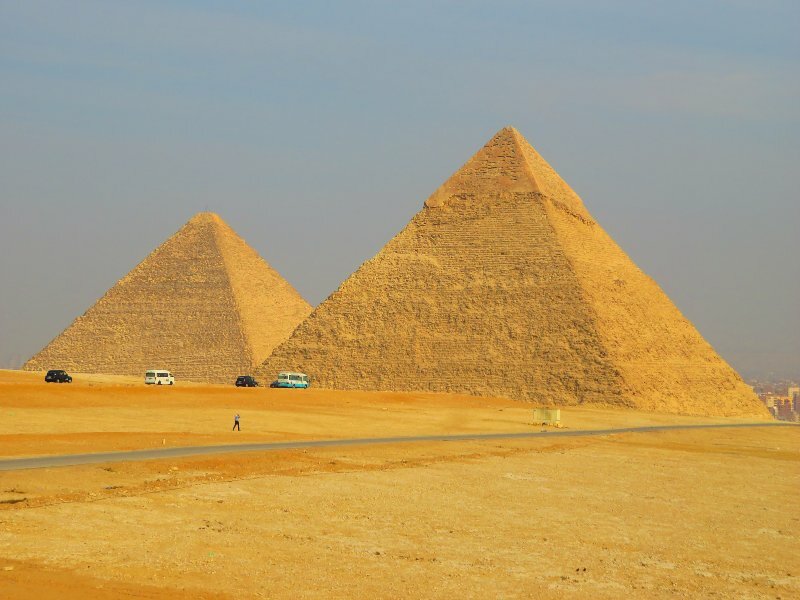 We spend lots of time walking around the pyramids at our own pace, but, we didn't go inside. Next time, I'll refer to this again. Walking around at your own pace is the best part.